Bryan went out of town on a business trip. I wanted to make him some peanut butter cups (because he loves peanut butter cups), but it turns out PB cups are kind of complicated. Truffles, on the other hand, are easy. And when B got sent home two days early, I decided the easy route was the way to go. I’m not entirely satisfied with the truffle centers — they needed a little more PB to hold them together, or they needed to be frozen before coating or something (a couple of them started to fall apart while dipping). And they’re definitely not pretty, but I’m not actually sure how to make pretty truffles. I will leave that to professionals. 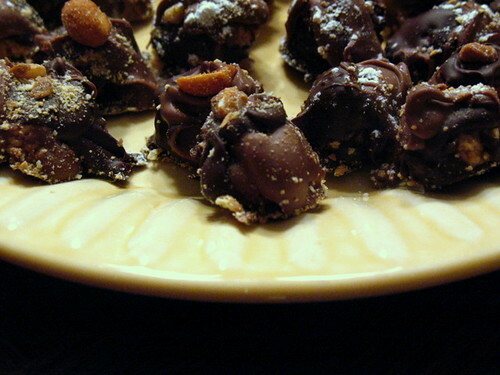 This recipe comes from Chow Hound, but with a few changes (I cut it in half and added some dark chocolate). They note that the cups will keep up to three weeks in the fridge. That is a lie–they kept a bit less than 24 hours (because B had eaten them all. Well, I had a couple. They were delicious). A pinch of salt – I forgot this. But it would have been nice. You’ll also need a saucepan, some heavy glass bowls, tin foil, and an ice cream scoop or large spoon. Put the graham cracker crumbs, powdered sugar, and peanut butter in the food processor and mix it together until it has the texture of cookie dough or similar — it will clump together readily. If it seems crumbly, add more peanut butter. Using a teaspoon, scoop mixture into teaspoon-sized balls and place on a cookie sheet or baking dish lined with foil. Put these into the fridge or freezer for at least an hour. There are a lot of discussions on this–here is one of the better ones. Basically you have to maintain the crystal structure of chocolate as you melt it, otherwise it will not solidify correctly. People don’t want truffles to get all over their fingers. If you’re thinking tl;dr or just don’t care about the science, I’ll tell you approximately what I did. Otherwise feel free to use your favorite tempering method for melting the chocolates (melt them separately and keep them warm over a pot of water–don’t let the water touch the bottom of the bowl they’re in). Place chocolate in a heavy glass bowl (like Pyrex). Put it over a pot of water and bring it (the water) to a boil. Keep an eye on the chocolate during this period. After a while, it should begin to look melty, but still be in the shape of the chocolate chips. Remove the bowl from the heat and mix the chocolate. All the chips should mush together into a smooth mixture without lumps. At this point, add a handful of chocolate chips (of the same type, milk or dark chocolate) to act as seed crystals. Because we melted the chocolate at a fairly low temperature, the seed crystal step may not be necessary, but it can’t hurt. The residual heat should melt the newly added chips; otherwise, scoop out anything that doesn’t melt. Put the bowl back over the boiling water briefly if the chocolate gets stiff. You are now ready to dip. Dip an ice cream scoop or large spoon into the chocolate. Shake it off so it is coated with chocolate. Put the truffle center in the ice cream scoop/spoon and rotate it until it is covered in chocolate. Then put it on a foil-lined baking sheet. Do 12 in milk chocolate and 12 in dark chocolate, then use the remaining chocolate to touch up the bald spots (use the semi-sweet here on the milk chocolate truffles and vice-versa). If one of the centers starts to break up while you’re dipping it, don’t panic. Just put it on the baking sheet and put a big dollop of chocolate on to hold it together. It will harden into a truffle. 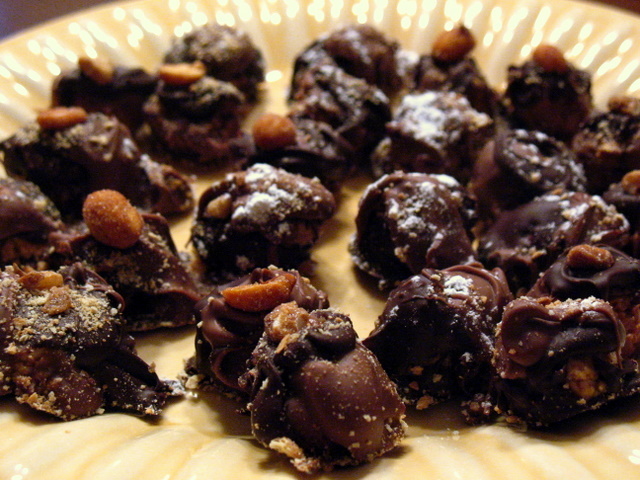 You can top the truffles with: powdered sugar, sugared walnuts, honey-roasted peanuts, whatever strikes your fancy. I went with a little of everything on the off-chance that if they were ugly to begin with, becoming really ugly would somehow make them cute again. When all the truffles are coated, put them into the fridge for another 30-60 minutes, until the chocolate is hard. Because you tempered the chocolate, you shouldn’t have prob lems removing the truffles from the cookie sheet and putting them on a plate. That’s it. Not too hard; the active parts of the recipe only take about 30-40 minutes all together. If you’re really patient you should make a big batch with different flavors and give them to people for Hannukah. I’m not really patient, so I only make truffles for people I really like.